Stalwart Florida Cracker Martha Jane Pacetti tells, in her earthy style, of her early struggles living in the primitive Florida of the 1800’s. Born on the Spruce Creek, she marries at 14 to a fisherman in his forties who owned all of what is today south Daytona Beach. 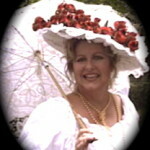 They were married at Dunlawrton Plantation. Her first home on the River was near the Inlet and made of driftwood. They were the first white settlers to live in that region. 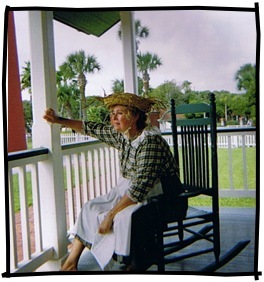 She endured the Indian Wars as a child and then the Civil War separated the couple but through hard work they created a thriving business as fishing guides to the wealthy visitors from Flagler’s hotels before selling land for the Ponce Inlet Lighthouse to the Federal Government. Throughout the years Martha encountered fascinating Florida pioneers from struggling working men to millionaires from the north seeking a tropical paradise and a good meal at her renown boarding house built at the Lighthouse. Martha Jane lived many adventures both tragic and amusing in rugged early Florida and she just loves to talk about it all.